At only 67, Israel is the most reliable, capable, predictable, democratic and unreserved ally of the U.S. This is in direct contrast to the violent, unreliable, turbulent and generally anti-U.S. Arab street. PLO leader Mahmoud Abbas, left, and leader of the Hamas political bureau, Khaled Mashal. Israel suspended peace talks with the Palestinian Authority (PA) last week following reports that the PLO intended to form a unity government with Hamas, a terrorist organization that refuses to recognize Israel. The Obama administration, AIPAC and many lawmakers highlighted the dangers of the PLO’s path. And yet, others noted that a unity government could present new opportunities for reaching a two-state solution. But it has not happened yet, and we do not know if it will. Similar attempts have failed before. Also, we do not know what the terms will be if it does happen, and whether Hamas will change any of its positions. If that is true, then this arrangement could bring us closer to peace. Indeed, the Palestinian president, Mahmoud Abbas, said on Saturday that the unity government will recognize Israel, reject violence, and recognize the legitimacy of international agreements. Can we rely on Abbas’s word? I would not. But I would wait for his assurances to be proven false before taking action. Some lawmakers have already threatened to cut off funding for the PA because Hamas a is terrorist group, and it is illegal for the U.S. to provide funds to terrorist-designated groups. But the State Department argues that until we get more information, we will not know whether the law requires the U.S. to cut off funds. Whoever chooses the terrorism of Hamas does not want peace. The George W. Bush administration pressured Israel into allowing Hamas to participate in the 2006 Gaza elections, thus conferring on Hamas a legitimacy it could not have otherwise achieved, and rescinded $289.5 million in loan guarantees for Israel as punishment for what Bush considered illegal settlement activity. But the Obama administration has never pressured Israel to act contrary to what Israel perceives as its best interests. Hamas is an Islamist terrorist organization that seeks Israel’s destruction and attacks innocent civilians. Any Palestinian government that includes Hamas cannot be a negotiating partner unless it meets longstanding Quartet demands ensconced in U.S. law: recognize Israel, reject violence, and accept previous Israeli-Palestinian agreements. The reconciliation agreement, if implemented, could provide a response to exactly these arguments by creating a government that represents all the Palestinians. The reconciliation agreement is also an opportunity because Hamas’ serious problems might force the organization to change direction, as happened with Yasser Arafat and the PLO after the 1991 Gulf War. The unity deal calls for Hamas to join the PLO and accept its principles — which includes the recognition of Israel and acceptance of the Oslo Accords and the Road Map. The significance of this agreement is also that for first time, Hamas seems willing to give up some of its grip on the Gaza Strip in favor of a unity government. Implementation of the agreement will also mean elections for president and the Palestinian parliament, which have not taken place for years. Given the precarious condition of the Hamas in Palestinian public opinion, especially in the Gaza Strip, new elections will almost certainly decrease its political power. New elections will also renew Abbas’ mandate — or bestow greater public legitimacy on whoever might be elected in his stead — making the Palestinian leader a stronger, more stable and more reliable partner for Israel. Militant religious movements don’t jettison their catechisms that fast. It is quite possible, however, that Abbas and his Fatah negotiators could obtain Hamas agreement to accept domestic portfolios in a unity government while Fatah holds the foreign affairs and security slots and handles peace negotiations with Israel. Some Hamas leaders have suggested such an arrangement in the past, with the understanding that if the negotiations produce an agreement and it’s approved in a Palestinian referendum, Hamas will accept the public’s will and live with it without endorsing it. It’s not such a hard arrangement to understand. After all, Netanyahu heads up an Israeli government that hasn’t approved the two-state principle he himself says he embraces. Indeed, two of his coalition’s four parties, including Naftali Bennet’s HaBayit HaYehudi-Jewish Home party and Bibi’s own Likud, are formally, flatly opposed to Palestinian statehood. Put differently, they haven’t recognized the Palestinians or their right to a state. Bibi’s made it clear that he considers himself mandated to conduct negotiations toward a goal that his own party and a majority of his coalition oppose. If he’s as serious about peace as he says he is, he ought to be able to accept a Palestinian negotiating partner that operates under the same rules he does. Israel doesn’t get to pick its enemies. It has to make peace with the ones it has. Hamas is one of those enemies. And Netanyahu’s argument doesn’t take into consideration that, theoretically at least, the Palestinian Authority could, over time, help moderate Hamas and bring it more into the two-state fold. But who am I kidding? Maybe both of Netanyahu’s superficially contradictory beliefs are true. Maybe he can’t make peace with a divided Palestinian entity. And maybe he can’t make peace with a unified Palestinian entity. Maybe he can’t make peace with any Palestinian entity because members of his own political coalition are uninterested in taking the steps necessary for compromise. I hope Jeff Goldberg’s second paragraph is wrong, but Israel gets to elect its leaders, and Israel, not the U.S., will have to live, or die, with the risks it makes for peace and the chances they choose not to take. We in the U.S. should not pressure Israel to act against its perceived interests. Rather, we should do all we can to bring the parties together and create an environment conducive to progress, recognizing, as President Obama does, that only the parties to the conflict can solve the conflict. The President of Israel, Shimon Peres, pushing 90, celebrates his longevity with a birthday bash this week that include thousands of invited guests and hundreds of reporters. It behooves the journalists who cover the Peres birthday event to hold Peres accountable for policies that Peres stands for. In the media, longevity allows for long memories. 14 questions follow the jump. In 1981, Peres opposed and tried to interfere with Menachem Begin’s 1981 decision to bomb Saddam Hussein’s Iraqi nuclear reactor. Does Peres have any regrets for his opposition to the destruction of that nuclear reactor? Peres is proud of the Oslo peace accord which he helped facilitate between Israel and the PLO on the White House lawn on September 13, 1993. However, on October 7, 1993, the left wing newspaper Al HaMishmar revealed that the PLO would not ratify that accord, and, indeed, the PLO has never ratified that accord. Instead of heeding the Al HaMishmar report, Peres, then Israel’s foreign minister, dispatched his Deputy Minister, Yossi Beilin, to fly to Tunis to thank Arafat for ratifying the Oslo accord, which Arafat and the PLO never did. Why does Peres promote an unratified accord? In 1994, Rabin, Peres, and Arafat made an agreement that Arafat’s armed forces would comprise no more than 9,000 inductees, and that any Palestinian under arms would first have to be vetted by Israeli intelligence to ensure that he did not have a background in terror activity. Yet as early as December 1993, it was discovered that the PA had drafted two Arab residents from the Arab village of Tequa who had murdered the curator of the Herodian, David Rosenfeld, in 1982. In December, 1995, Arafat announced that his commanders for Ramallah and Nablus were men who planted bombs in Jerusalem’s Zion Square on July 5, 1975, killing thirteen people. As of 1995, the PA armed forces counted as many as 19,000 under arms by 1995 and now comprise a least 30,000. Since 1995, the IDF acknowledges that it no longer knows who has been recruited into the PA security force. Can Peres answer the question as to whether the PA armed forces now include volatile terrorists within its ranks? Throughout 1994 and 1995, when private agencies produced videos of Arafat’s speeches where Arafat expressed support for Jihad to liberate Palestine, Peres implored Israel TV not to air Arafat’s speeches in the Arabic language. Peres also asked the US Congress not to view the videos of what Arafat was saying in Arabic? Does Peres express regret for trying to obfuscate Arafat’s message in the Arabic language? In December 1994, when Peres and Rabin conducted a briefing for the media in Oslo before they both received the Nobel Peace Prize together with Arafat in, I asked them if Arafat had fulfilled his commitment to crush the Hamas. Both Rabin and Peres indicated that he would do so. A few hours later, when I asked Arafat the same question, as to whether the PLO leader would crush the Hamas, Arafat’s response was clear: “Hamas are my brothers. I will handle them in my way.” And Arafat did handle the Hamas – by bringing them into his new regime, as full coalition partners. In May, 1995, Arafat’ security forces announced that they would provide Hamas with arms. In December, 1995, Arafat invited Hamas to join his provisional regime. In 1996, Arafat appointed Hamas officials to run the religious departments and schools under his authority. By fall 2001, the IDF confirmed that Islamic terror groups train and operate in the full view of the Palestinian Authority security services, and that the Islamic terrorists get a clear message that their activity operates with the full blessing of Arafat’s regime. The promise of the Oslo process was that Arafat would crush the Hamas, not co-opt Hamas. Does Peres feel today that Arafat betrayed him? Norwegian statesmen Kare Kristiansen resigned from the Nobel Prize committee because of the Nobel Prize bestowed upon Arafat. The same Kare Kristiansen told the Norwegian media that Peres had promised financial remuneration to fellow Nobel Prize Committee member Terje Larsen in order to ensure that he would share the Nobel Peace Prize with the late Prime Minister Rabin. In 2002, I interviewed Mr. Kristiansen and he explicitly affirmed that he had witnessed the deal made between Peres and Larsen which assured Larsen that he would be “well rewarded for his efforts.” How does Peres respond to the allegation that he paid good money for the Nobel Peace Prize? The Palestine National Council, meeting in April 1996, did not vote to nullify the PLO charter to destroy Israel. However, Peres proclaimed that Arafat did fulfill his promise to nullify amend the PLO charter. It turned out that the resolution that Arafat had told Peres that they would pass was not even brought up for a vote. What is Peres’s current perspective of the PLO charter, which was never changed? In March 2007, when a new “Palestinian unity government” was formed to include Hamas and the Fatah in a coalition government, Peres declared that “only with economics can we make peace.” Peres went on to say that if members of terrorist groups perceive economic incentives, they will cease to be terrorists. Does Peres truly believe that a terrorist organization which acts upon a deep rooted ideology can be enticed by a good business opportunity to abandon the path of terror? Peres repeats over and over that the “gap between Israel and the PA is very small,” while consistently describing Abbes as “Israel’s hope for peace.” However, Peres refuses to comment on the war curriculum that Abbas and the PA ministry of education have introduced in the PA. Peres consistently refuses to say if he has even reviewed the new PA school books, which have introduced a curriculum of war for the next generation of Palestinian Arab school children. On March 1, 2000, Peres addressed an international colloquium for the Jewish media, where Peres announced that the PA had adopted a PA school curriculum for peace. When I pointed out to Peres that the curriculum that he had quoted from had been vetoed by the PA, Peres moved away from the microphone and said “I know.” The Israeli intelligence report on PA school books now being used in PA schools, prepared by Dr. Noah Meritor, is accessible at http://www.terrorism-info.org…. Why will Peres not comment on the current PA curriculum of war? Before the Gaza retreat, Peres, then deputy Prime Minister, Peres announced on July 7th, 2005 that the American government had allocated $2 billion to cover the costs of disengagement. That assurance was quoted by the mainstream Israeli media for months to come. However, on July 12th, 2005, the spokesman for the US treasury department told Israel’s leading business newspaper, GLOBES, that the US was not giving one penny for the Disengagement Policy. Where did Peres get the idea that the US would fund the Israel retreat from Gaza? Before Israel’s 2005 retreat from Gaza, Shimon Peres accused southern Israelis of “stoking hysteria” about the rockets and asked “What’s the big deal?”, while calling the kassam missile as a harmless. “Kassam Shmassam”, said Peres. Since the southern region of Israel has suffered 29,000 aerial attacks from Gaza and 49 people killed over the past ten years, what is Peres’s perspective on the assurances that he gave the people of Southern Israel before Israel withdrew its civilians, soldiers, and bases from Gaza? In 2011, Shimon Peres dispatched a letter of praise to J Street, one day after J-Street called on the US to support the PLO resolution at the UN Security Council calling for the halt of settlement construction, including east Jerusalem, which the Obama administration vetoed after all other permanent members voted were in favor. Does Peres have any second thoughts about sending such a letter of support to J Street? 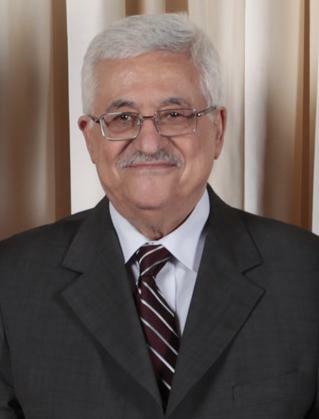 On January 4, 2013, Machmud Abbas, head of the Palestinian Authority, delivered a new year’s message in which he lauded Adolf Hitler’s Arab ally, Haj Amin Al Husseini, the Mufti of Jerusalem, as someone whose legacy should be emulated” by the Palestinian people, Since Israel’s President Shimon Peres never stops in his adulation of Abbas, Peres was asked if he would condemn Abbas’s praise of the Mufti, yet Peres refused comment on Abbas’s praise of the Mufti. Why would Peres not condemn Abbas’s praise of the Mufti? Peres continually endorses an independent Palestinian state under the leadership of Abbas, as a Palestinian state that would coexist as a peaceful neighbor with Israel. Yet UNRWA remains in tact, maintaining 5 million Arab refugees and their descendants in “temporary” refugee camps, under the premise and promise of the right of return to Arab villages that no longer exist within Israel. Why does Peres not support a change in the UNRWA mandate, which contradicts his vision of a “two state solution”? Recently, US Secretary of State John Kerry passionately called for the renewal of talks with the Palestine Liberation Organization (PLO). Former President Bill Clinton, who hosted the PLO-Israel ceremonies on the White House lawn twenty years ago, is on his way to Jerusalem for high profile lectures, where he will also call for renewal of negotiations. And Shimon Peres, Israel’s president, who served as Israel’s foreign minister at the outset of negotiations with the PLO two decades ago, is about to convene thousands of dignitaries at a conference at the President’s mansion, that will call to expedite negotiations with the PLO. Veteran observers of middle east politics may ask: what is there to negotiate about? Indeed, there is an item on the table that is hardly a minor detail: The Palestinian Liberation Organization did not ratify the Oslo Accords after Yasser Arafat and Mahmuod Abbas signed them on the White House lawn. 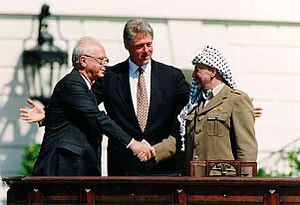 On September 13, 1993, at the White House, Israeli Prime Minister Yitzchak Rabin and Israeli Foreign Minister Simon Peres signed the “Declaration of Principles” (DOP) between Israel and the PLO together with Arafat and Abbas. The agreement, which had been hammered out in Oslo, stipulated mutual recognition between Israel and the PLO. It required the PLO to cease and desist from terrorism, and for the PLO to nullify its covenant, which calls for Israel’s destruction. The Israeli Knesset ratified the accord one week later, by a vote of 61 to 50, with 9 abstentions. However, what received hardly any attention was the fact that on October 6, 1993, the PLO executive did not ratify the Oslo accord, for lack of a quorum. Very few people know or remember that Pinchas Inbari, the only Israeli correspondent covering the PLO in Tunis at the time, writing for the Israeli left-wing Hebrew newspaper Al HaMishmar, broke the story that Arafat announced in Tunis that he could not get a quorum of the executive council of the PLO to ratify the Declaration of Principles of the Oslo Accords. Al HaMishmar then ran a headline, which reported that the PLO did not ratify the accord. Carrying Al HaMishmar in my hand, I walked into the office of the Israel Government Press Office director at the time, Mr. Ori Dromi, and showed him the headline. Dromi, an appointee of Rabin, made it clear that from the Israeli government’s point of view, this meant that Arafat signed the accord without the sanction of the PLO. The rest of the Israeli media, however, did not report that the PLO never ratified the accord, and the Israeli government acted as if it had done so. Inbari was scheduled to appear on Kol Yisrael’s popular morning radio show when he got back from Tunis. However, the Prime Minister’s office asked Kol Yisrael to cancel that appearance. Instead, the Israeli government dispatched then-Deputy Minister of Foreign Affairs, Yossi Beilin, to fly to Tunis to thank Arafat for facilitating the ratification of the Oslo accord, which the PLO never did. Why is this important? According to the Israeli law, since the PLO did not ratify the Oslo accord, which renounce terrorism, the PLO and Fatah were never stricken from Israeli law books as “a terrorist entity,” a status that the PLO received on March 1, 1980. The same goes for American law. In March 2002, US government designated the Al-Aksa Martyrs Brigades of the Fatah as a terror organization. That designation was never changed. Under US law, any government that aids and abets an organization defined as a terror organization will forfeit US foreign aid assistance. On two occasions, the Palestinian National. Council gathered to discuss the PLO Covenant, which calls for Israel’s destruction: on April 24, 1996 and on December 14, 1998. On neither occasion did the PNC cancel it. In other words, there is a real reason to renew negotiations with the PLO: The first items on the agenda would be to ask that the PLO finally ratify the Declaration of Principles of non violence and mutual recognition, which constituted the essence of the Oslo Accord. The other request would be to cancel the PLO Covenant. In a wide-ranging speech punctuated by 30 standing ovations, Netanyahu praised the many thousands of brave young people standing up in the Arab world for democratic rights – rights that Israel’s Arab minority have enjoyed for decades. He also warned that Iran’s militant Islamic leaders remained determined to build nuclear weapons and time was running out to stop them. And he appealed directly to Palestinian President Mahmoud Abbas to tear up his recent deal with Iranian-backed Hamas, whose Charter calls for murdering Jews wherever possible, and enter peace talks with Israel to achieve a state. President Abbas must do what I have done. I stood before my people … and I said, ‘I will accept a Palestinian state.’ It is time for President Abbas to stand before his people and say, ‘I will accept a Jewish state’. Those six words will change history. They will make clear to the Palestinians that this conflict must come to an end — that they are not building a state to continue the conflict with Israel, but to end it. They will convince the people of Israel that they have a true partner for peace. With such a partner, the people of Israel will be prepared to make a far-reaching compromise. I will be prepared to make a far reaching compromise. Netanyahu made clear that he was willing to give up parts of the Jewish ancestral homeland of Judea and Samaria, also known as the West Bank, so that a Palestinian state could be established. No distortion of history can deny the 4,000-year-old bond between the Jewish people and the Jewish land. But there’s another truth. The Palestinians share this small land with us … They should enjoy a national life of dignity as a free, viable and independent people living in their own state. This also meant that some settlements would not be inside Israel after the establishment of a Palestinian state, while the major suburbs that have been built close to Tel Aviv and Jerusalem would remain Israeli. Recognizing that a future Palestine had to be economically viable to succeed, Netanyahu said Israel would be generous in the territory it gives up. But he stated once again that he was not prepared to go back to the pre-1967 lines which were impossible to defend and he would not allow Jerusalem to be divided. Palestinians also had to stop naming public squares after suicide bombers and teaching their children to hate and they had to give up the “fantasy” of one day flooding Israel with the descendants of refugees. Palestinians from around the world should have a right to immigrate, if they so choose, to a Palestinian state. This means that the Palestinian refugee problem will be resolved outside the borders of Israel. The Israeli leader joined an exclusive club as the fourth world figure to address a joint session of Congress more than once. The other three were Winston Churchill, the late Egyptian President Anwar Sadat and Nelson Mandela. The first part of Netanyahu’s hour-long address dealt with the wider Middle East region and Iran, where Netanyahu saw the greatest danger to Israel’s peace and security. The hinge of history may soon turn. For the greatest danger of all could soon be upon us – a militant Islamic regime armed with nuclear weapons. Militant [Islam] could exact a horrific price from all of us before its eventual demise. Iran’s leaders would only be daunted if the West maintained a credible deterrence, leaving all options on the table, Netanyahu said. He added that Iranian leaders who express genocidal aims should be banned from every responsible forum in the world. Complete text of speech after the jump. the Palestinians have begun to build a better life for themselves. Prime Minister Fayad has led this effort. I wish him a speedy recovery from his recent operation. And when I say tomorrow, I don’t mean some distant time in the future. I mean – tomorrow. Peace can be achieved only around the negotiating table. The Palestinian attempt to impose a settlement through the United Nations will not bring peace. It should be forcefully opposed by all those who want to see this conflict end.